This article is a case study of how low frequency modeling tools can be used to ensure consistent, relatively flat seat-to-seat bass response in a home theater. This particular case study focuses on the Acoustic Frontiers demo room and shows how we determined the optimal number and placement of multiple subwoofers using these tools. Consistent seat-to-seat bass response. Consistent bass response is important because if each seat has the same frequency response as the others then we can successfully perform system equalization to tailor the response. If seats vary in their response from each other then EQ cannot be applied because it is global in effect – if one seat has a 10dB boost at 60Hz and another is flat at 60Hz then when we equalize out this boost we are making the response better in some places and worse in others. Major speaker boundary interference nulls filled. Speaker boundary interference is phase based cancellation caused by the interaction of the direct and reflected sounds. We have seen its effects first hand in a number of theaters where the only subwoofers were located in the front of the room. What happens in this scenario is that when the sub is playing there is a strong ‘bounce’ or reflection from the back wall behind the listeners that combines with the direct sound to create a substantial null. These nulls negatively effect the quality of sustained low frequency effects sounds in the theater. Our demo room is a very high performance home theater measuring 12′ wide by 16’8″ long by 8′ high. We have a single row of three Fortress home theater recliners at a distance of 10’4″ from the front wall. The room has three seats because that is the maximum number of home theater recliners that would fit in the room whilst maintaining great audio quality in all three seats. 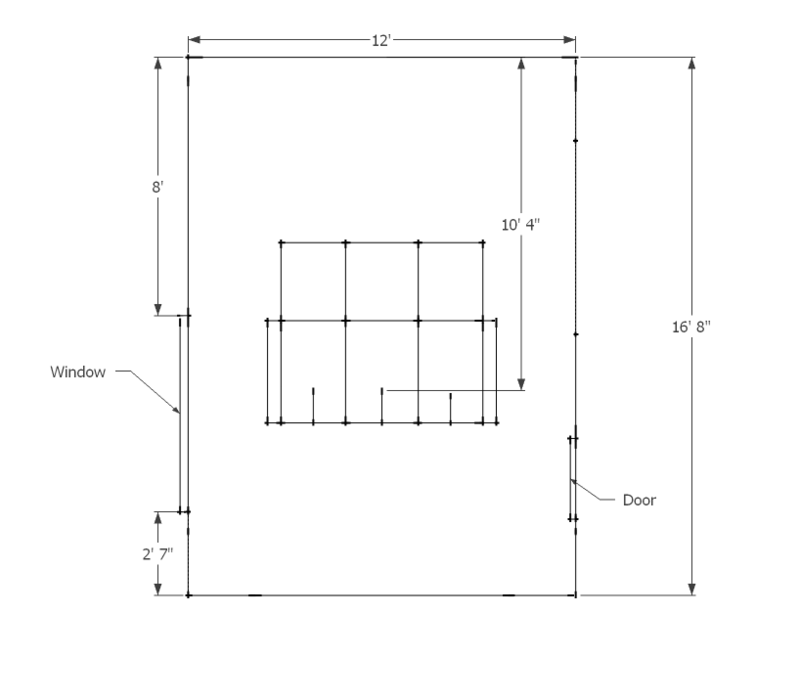 See our home theater seating layout blog article for our approach to design. 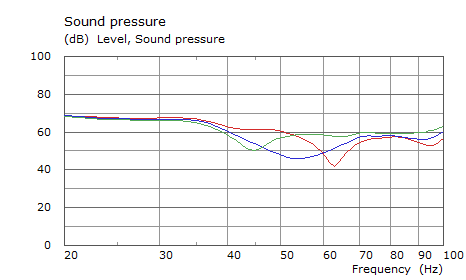 Our proprietary low frequency modeling tools enable us to construct a model of the room and predict how different combinations of subwoofer number, subwoofer placement and listener placement affect frequency response. In this first scenario the results of using one sub placed at 3ft along the front wall were modeled. The red, green and blue traces on the graph show the predicted frequency response at each of the seats in the theater. Clearly the seat-to-seat consistency is very low in the 40-70Hz region and each listener will have substantially different bass quality experiences. This second scenario predicted the frequency response for two subwoofers placed 3ft and 9ft along the front wall. You can see the seat-to-seat variability is extremely low, so low in fact you mainly just see the green line as the other two are hidden beneath it! There is still room for improvement, however, since there is a large dip around 50Hz caused by speaker boundary interference cancellation from the back wall. Whilst we could equalize this response (since all seats are consistent) we would lose a lot of headroom by doing so. The final scenario shows the frequency response for four subwoofers, two located on the front wall at 3ft and 9ft and two on the back wall at the same distances. 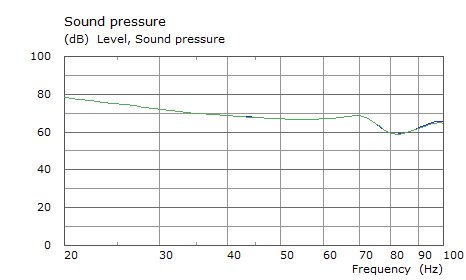 You can see that the bass response does not exhibit the large dip around 50Hz. We can equalize the response effectively without losing excessive headroom. This is the scenario we went with when installing the theater. 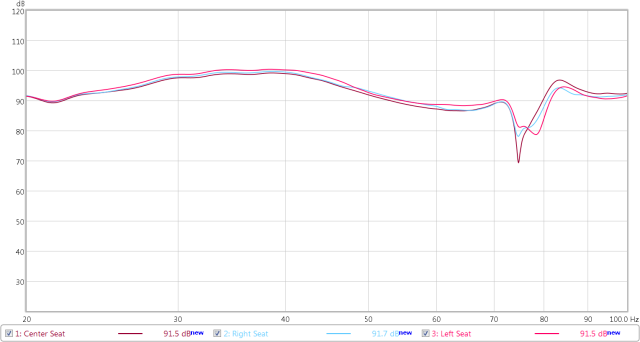 After installation we measured the raw frequency response of the subwoofers in each of the three seats. Please note that the response does not have any smoothing and has not been equalized. A pretty amazing result! Measured seat-to-seat variability is extremely low and the response very smooth in the region below 70Hz. We now have freedom in subwoofer equalization since all seats have the same response. Comparison of the actual results with the predictions above reveals some deviations in the <30Hz region and in the 70-90Hz region but overall we are very close to optimal! Couldn’t you have dealt with the 50hz SBIR null with only 2 subs? One on the frontwall and one on the backwall; maybe at opposite corners? Hey, Nyal. If SPL reference levels could be maintained, how well would sub 1 at 50% of front wall and sub 2 at 50% of back wall work? Or would sub 1 at 25% front and sub 2 at 75% of back wall work better? Depends what you are trying to achieve…without knowing the specifics of your situation (room dimensions, number of seats, seat placement) it’s hard to provide definitive advice. However generally speaking the 50% of front wall and 50% of rear wall works better. The 25% / 75% placement doesn’t energize the 2nd axial width mode so much though.